This site is a prime example of a mature mixed wood forest. The canopy of large white spruce and balsam poplar trees protects an understory of smaller plants, including a rich assemblage of shrubs (mountain ash, low-bush cranberry, chokecherry, red-osier dogwood, Saskatoon, rose, etc.). The presence of ferns and 90-year old spruce trees indicate the richness and maturity of this site. These “old growth” qualities attract many animals and are relatively unique in Edmonton. The site is likely used as a stepping stone for mammals such as white-tailed deer in their movement from Whitemud Creek Ravine in the west to Blackmud Creek Ravine in the east. 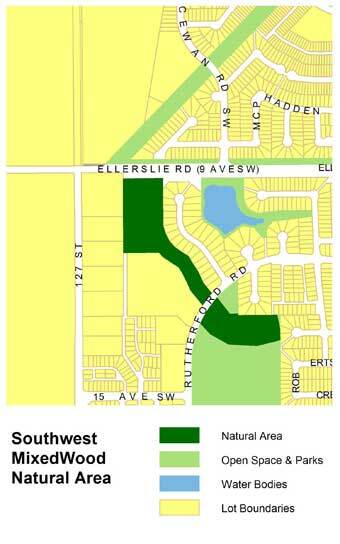 The site is located south of Ellerslie Road and east of 127 St., with trail access from the south and west sides. Formal trails are provided through the natural area that provide excellent viewing opportunities. The trails are also connected to the naturalized stormwater facility to the east of the natural area and the school/park site to the south. Keep an eye out for white-tailed deer, snowshoe hares, red squirrels, porcupines, northern flying squirrels, red-backed voles, striped skunks, red fox and coyote. Woodland bats such as the silver-haired bat might also make use of the numerous snags with cavities created by woodpeckers. Birds you might see include Golden-crowned Kinglet, Swainson’s Hawk, Red-tailed Hawk, Pileated Woodpekcer, Blue Jay, Black-billed Magpie, Black-capped Chicakdee, Red-breasted Nuthatch, Cedar Waxwing, White-throated Sparrow, Dark-eyed Junco and Pine Siskin, among others.